As many of you readers are aware, I am a Vulcan. I cannot, however, claim to be a full member of that genus since my mother was a human, therefore making me half-Vulcan, half-human. I have struggled with my sense of identity since my childhood days on Vulcan where I was often subjected to the ridicule and prejudice of Vulcan children seeking to illicit an emotional response out of me. Using my Vulcan training, however, I was able to suppress my emotions and use reason and logic to remain focused and excel in my studies. This eventually led to me being named first officer aboard the USS Enterprise. When I came back to Earth recently, I was pleased to find another half-Vulcan, half-human who has overcome his critics and excelled in his field: New England Patriots head coach, Bill Belichick. And while Belichick inherited his physical appearance from his human side, I assure you he is through and through a Vulcan on the inside. When Belichick takes the field Sunday in Indianapolis for Super Bowl XLVI, he will be making his fifth appearance as coach of the Patriots, putting him in the discussion for greatest coach of all-time. 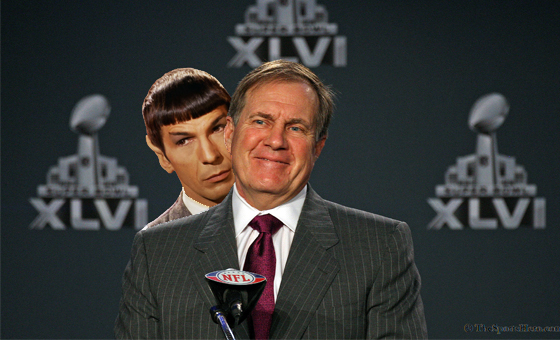 Many have wondered what the key to Belichick’s success has been, and I am here to tell you the answer is quite logical if you understand the Vulcan way of life. Below, I will detail three key components of Vulcanism and tell you how Belichick has applied each to his coaching methods and way of life. EMOTION: As a matter of custom and policy, Vulcans are taught to suppress and think past all emotional influences. We do this through rigid emotional self-control and meditative techniques. Bill Belichick has brought the Vulcan way of life to the NFL coaching ranks. Never before has the public been exposed to such a highly successful yet emotionally distant coach. Rarely has Belichick given you an insight into his psyche. Whether it is a win or a loss, Belichick addresses each question at his postgame news conference with the same monotone voice we’ve grown accustomed to. On the field, where the heat of battle and the grind of an intense game would take an emotional toll on any other coach, Belichick has been able to suppress all emotion and remain practical and logical in his coaching methods. With a regular season coaching record of 175-97, along with a 17-6 postseason record, Belichick has proven his method works. While some have questioned why coaching disciples of Belichick, such as Eric Mangini and Josh McDaniels, have not panned, my response to that is simple: for they are not Vulcan. MIND MELD: A Vulcan technique for sharing thoughts, memories, and knowledge with an individual. It has helped me save members of the USS Enterprise on more than one occasion. When used correctly, it can be a Vulcan’s most effective tool, something that Bill Belichick has proven during his tenure as coach of the Patriots. Belichick has been able to connect with his players and share his knowledge and methods for handling both success and defeat. People are fascinated when they look at Belichick’s teams and how they seemingly function as a collective unit. Even during their pursuit of an undefeated season back in 2007, players repeatedly talked about how Belichick was keeping them humble, often serving up pieces of “Humble Pie”. At this year’s Super Bowl, players have stuck to the script and avoided answering questions about player injuries, something Belichick has become famous for. It is safe to say that come Sunday, Belichick will have his team prepared to face the Giants and reclaim the title of World Champion. FAMILY: Contrary to the Vulcan image of expressing no emotion, our family bonds can be just as strong and affectionate as they are for humans. For Belichick, the relationship he had with his father, Steve, helped form him into the coach he is today. Steve played for the Detroit Lions before later becoming an assistant coach and scout for the Naval Academy. Belichick reportedly learned to break down game film at a young age by watching his father and the rest of the Navy staff do their jobs. After winning Super Bowl XXXIX against the Philadelphia Eagles, Belichick could be seen on the sideline with his father enjoying the celebratory Gatorade bath. Today, the Patriots head coach can be seen hugging his son, Stephen, after a victory, a tradition he will look to continue on Sunday. Check back tomorrow for my fascinating ‘X’ factors for Sunday’s game. As always, live long and prosper.